City police have smashed a professional gang of thieves that stole goods intended for export after they were loaded into containers and placed on trucks. The thieves were able to take the goods without either breaking into the containers or breaking the seals placed by customs’ agents. Recently, the police have received letters from the managers of export and container transport companies denouncing a professional gang of thieves for stealing a large volume of goods transported by container trucks. According to these letters, goods vanished after being sealed and locked in containers, although the locks and customs’ seals remained intact. 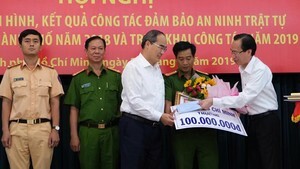 The police investigated and located a suspicious gang in An Phu Commune of Binh Chanh District. On May 6 at 2:00 a.m., the police raided the Duong Viet Bus Station at An Phu Tay Commune of Binh Chanh District and found ten gang members with the “hi-technology” needed to steal products from a container. The police arrested eight, including two lookouts. The two others ran, but were arrested that afternoon. The police seized drills, pliers and hammers. According to the prisoner’s statements, Nguyen Van Cu (also known as Black Cu), 43, of Long Binh Ward in District 9, HCM City is the leader of the gang. Cu, together with Nguyen Quoc Anh, 24, and Pham Van Hao, 25, of Thanh Binh District in Dong Thap Province, conspired with several drivers working on north –south truck routes to steal the goods loaded in their containers. After the good were taken out of the containers, they hired a team of loaders to carry and load them onto smaller trucks and transported them to another place. The gang stole billions of dong worth of goods. Cu and his accomplices stated that they would steal goods worth hundreds of million of dollars from each container. For each robbery, they paid between VND300,000 -500,000 to the team of loaders, VND500,000 to security guard posted where the trucks were parked and between 8-15 million to the driver.